Eden is the fifth studio album from Jennifer Parsignault. It is the result of a three year journey. Filled with emotion and colorful lyrics, Jennifers music is both introspective and profoundly spiritual. The lyrics describe a story, an event or an moment in time, woven into multiple layers and resonating on many levels. Her voice is, in one moment vulnerable and intimate, in the next pure strength and power. Her music both soothes the soul, and brings the listener on an emotional journey of intense joy, spiritual awakening or wrenching heartbreak. Hailing from Boston, Massachusetts, Jennifer started out on the violin, later adding piano as her main instrument. She studied at Berklee College of Music before heading westward to pursue music. During this time, she worked with a wide variety of unknown and known artists, including Irene Cara, Miguel Kertzman, Lita Ford, Katelyn Hopkins, and Bang Tango. She also began recording her own songs. 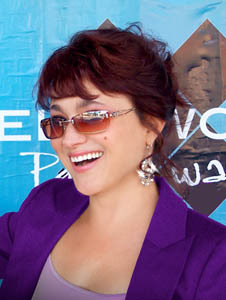 Jennifers music has been featured in film and television including independent films including the just released Go or It! (Lions Gate / Spark Hop Prods) "Kejar Amerika" and "Solid Cover". Television credits include Dawnsons Creek, MTV's "Undressed", A&Es Biography, LOGOs Coming Out Stories and Elephant in The Room, PBS History Detectives and Real Simple, Animal Planets Underdog to Wonderdog, Bravos Flipping Out, and Discovery Channel's "Outward Bound". International television includes Australia's, "The Saddle Club" and Spain's "Hasiberriak" and "Goenkale". Previous albums include self-titled Jennifer Parsignault, RED, Oh, My and From the Dark.